Already drawing rave reviews for its renovation, Bayonet Golf Course has ushered in a new and exciting era for the landmark golf course that overlooks the famed Monterey Peninsula. Certain to provide both challenges and inspiration to golfers for generations to come, Bayonet has been re-sculpted by award-winning golf course architect Gene Bates. Like its companion course, Black Horse is steeped in golf and military history. Originally opened in 1964, the golf course was created on the site of the former Fort Ord by General Robert B. McClure, who christened it in honor of the 11th Calvary Regiment (nicknamed “Black Horse”) that was then stationed nearby at The Presidio of Monterey. 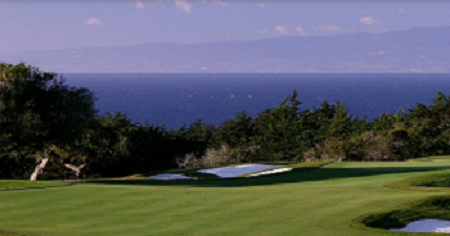 Always stimulating and in spectacular shape, and with Monterey Bay as its inspiring backdrop, the remodeled Black Horse is ready for the new era to begin. Bayonet, with its narrow playing corridors and steep, penal bunkering, has long been considered the most difficult test of golf on the Monterey Peninsula. The par-72, 7,104-yard course has retained its famous bite after the recent renovation by award-winning architect Gene Bates, but playability and strategic options have been greatly improved. The uphill, dogleg right, 476-yard, par-4 ninth hole exemplifies the course’s significant challenge.Black Horse, a 7,024-yard, par-72 layout, features sweeping vistas of the Pacific and is highlighted by fescue-framed fairways, bunkers with distinctive, serrated edges and slickly-contoured greens. The par-3 15th, created during the renovation, faces the bay and is sure to emerge as one of the great holes on the Peninsula.